The following steps walk through the main points of a typical field installation of an underground enclosure that is 24 inches by 36 inches or larger. And we'll share some do's and don'ts for installation. In all cases, it is important to comply with federal, state and local laws and any applicable building codes for a successful install. A successful install begins at the storage yard. Properly handling and transporting an enclosure to the job site will ensure that the enclosure is not damaged and the finished product performs as intended. Select the appropriate enclosures for the site by following the ANSI/SCTE Tier rating system for enclosures. More information regarding Tier ratings is available in Hubbell's Underground Catalog. Please call 8-1-1 to locate any buried utilities prior to digging. After carefully unloading the enclosure on site, survey and secure the job site. Hold a safety briefing and note the slope of the ground. Mark the dig spot with marking paint prior to operating the backhoe. During excavation, make the hole one to two feet larger than the enclosure on all sides. Excavate deep enough to accommodate six to eight inches of crushed rock and level the rock base. After digging the hole, add six to eight inches of crushed rock to ensure good drainage. As crushed rock is added, check the depth of the hole in relation to the grade of the surrounding area. Install an underground steel mesh rodent barrier if needed. The mesh barrier should be installed under any conduit. Secure any fiber, electrical, water, or gas connections prior to placing the enclosure. Remove the cover from the enclosure before lifting the box. Lifting strap should be long enough to not put undue stress on the lifting bolts. Move and position the box into place. Cut side walls to fit conduit. When lifting the cover, ensure that proper lifting straps are used. Avoid using mule tape, conduit pull tape, bungee cords, small diameter chains, or other lifting devices that are not designed to hold a heavy cover. Lift the cover high enough to not damage the box. 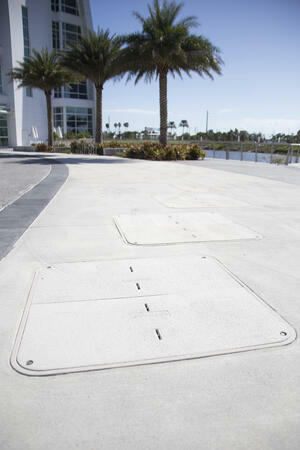 Dropping a cover can damage both the box and the cover, and the installed part might not perform as intended. Covers with lifting eyes can be lifted using a two inch wide strap with hooks attached. Some covers with openings may not have pull slots. If a cover with an opening needs to be moved, loop the lifting strap through the opening. Carefully guide the cover to place it on the box. Never lift a box with its cover still in place. Remove the cover and position four lifting straps on the box's lift positions. The angle of the straps should be at 30 degrees or less to a vertical line. Although it is common, putting a choker strap between two lifting straps can place excessive pressure on the lifting points. Different sized enclosures require different strap lengths. The chart on the upper right shows the minimum strap length for each sized box. When in doubt, use a longer strap to minimize the pressure on the side lifting parts and feel free to contact Hubbell with any questions prior to your install. Hubbell's Pencell HDPE enclosures will have different lifting points than the Quazite polymer concrete enclosures or fiberglass reinforced polymer enclosures. Between the second and third rib on the side wall of the box, drill a 1 and 1/4 inch horizontal hole. Clear any plastic debris from the hole. Use a 1 inch wide lifting strap designed to carry the load, and insert one end through the hole while pulling one end through the eye of the strap. Secure both one inch straps onto the lifting device. DT enclosures older than 2016, can be quickly modified in the field to create two lift points. Position the enclosure in the hole and note all conduit paths. The box may need to be cut to accommodate existing conduit paths. When cutting, use a diamond-tipped masonry hole saw or a cut-off grinder. Do not cut the enclosure's corners and do not remove more than 25% of any side wall. Avoid cutting any ribs on polymer concrete boxes. When removing a cut piece, use gloves to avoid getting fiberglass shards embedded in your hands. Knockouts and terminators can be pre-installed at the factory to save time in the field. Bracing should be added to the box prior to backfilling. Use proper lifting techniques when reinstalling the covers to avoid chipped or cracked box edges and covers. Bracing configurations vary based on the size of the enclosure. Consult the Hubbell Underground Enclosure catalog for specifics. Bracing can be added at the plant prior to shipping to help save time during field installation. Bracing should fit snugly to prevent movement during backfilling. After bracing the enclosure, carefully install the covers. Rough handling of covers during installation with heavy machinery can cause the lip of the box to chip and can damage the cover. Secure the cover prior to backfilling. Remove any debris from the hole. If needed, wrap the blocks with a rodent barrier prior to backfilling. For good soil compaction, tamp the area every time six inches of backfill is added. On HDPE boxes, work the backfill soil in between the side wall structural voids prior to tamping the soil surrounding the box. Backfill to grade. Secure any rodent barrier prior to backfilling. Tamp the initial backfill as necessary to ensure that conduit paths are not crushed. Using a power tamping machine commonly called a jumping jack can aid in soil compaction. Backfill to grade without damaging the enclosure. Large machinery can place excessive stress on side walls, so bracing is necessary to protect the enclosure and its components. Finish off the grading and cover with grass seed as needed. When installing underground enclosures, please ensure that all applicable federal state and local guidelines are followed to ensure a successful project.